EHF Pilates is an educational studio offering Teacher Training courses in addition to Private, Semi-Private and Group sessions. Join us for a Free Interactive small group workshop on the 1st Saturday each month at 10:30 am. 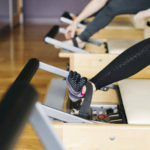 Pilates for injuries teaches ways to increase core and joint stability while adding flexibility and increasing movement freedom at home, traveling or in the studio… our goal is to provide smarter techniques to empower your body to become healthier and more stable. Register here… for April… Only 6 spots available. 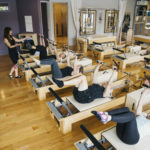 EHF Pilates offers a Cutting Edge Approach to Pilates Teacher Training facilitating a contemporary approach to the method developed by Joseph Pilates in the 1920s designed by Pilates Sports Center; one that preserves the essence of the original technique but incorporates today’s knowledge and principles. 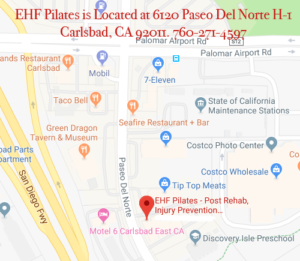 Small class sizes with personalized attention and anatomy lessons are provided by Master Trainer Natalie Walker in Carlsbad, CA 760-271-4597 (call or text). Students will learn the Classical and Progressive approach to Pilates all in one program using a beautiful, organized photographic manual. Our instructors are successful, sought after and return to us for continued workshops year after year. Upon completion of your Comprehensive Pilates Teacher Training program, you will be prepared to take the PMA Pilates Certification™ exam if you desire. Pilates teacher training courses are all held T/TH 12:30- 4:30 pm – $5,200 all-inclusive program. Secure your place in the 2020 program, place a deposit online to secure your seat today, call or text us at 760-271-4597 with questions! Private Courses: $8,700 – (Deposit of $500) – flexible schedule, course days and times scheduled with student and MT. Modular options $100 deposit each module required at least 1 week prior to the first day of the module. Fundamentals required for all. Contact Natalie at natalie@ehfpilates.com for more info! Please review our Program Terms & Conditions prior to submitting your application.